Natural Habitat Adventure’s Churchill Arctic summer trips are winding down and guide Moira LaPatourel submitted these images from the last trip. Looks like a group of happy travelers experienced all kinds of northern fun in Churchill! While polar bear activity has calmed down some from a couple of weeks ago, the tundra still reveals all the treasures of late summer as berries and other wildflowers are squeezing all they can out of the short growth season. Beluga whales in record high numbers have been all throughout the estuaries this summer. Last year some belugas were still present at the start of polar bear season in October and by the looks of this summer we may have a repeat of that this year. This has been one of the most successful Churchill Arctic summer seasons on record with bears and belugas in prolific numbers. With all the supporting scenery and wildlife, this Churchill Arctic summer will be etched in many traveler’s memories! The stark coastline of the Hudson Bay in the distance. Moira LaPatourel photo. A Natural Habitat group bonfire behind the town complex by the Hudson Bay. Nothing like a nice wine and cheese gathering to bond a group together. Moira LaPatourel photo. The hard – to – find Samuel Hearne etching along the Cape Merry path. Moira LaPatourel photo. Beluga whales frolicking in the Churchill River. Moira LaPatourel photo. The amazing polar rover escorts Natural Habitat groups out to the coast in the Churchill Wildlife Management Area. Moira LaPatourel photo. Summer wildflower season in Churchill is still over the horizon, one filled with snow and cold, but a preview of some of the beautiful plants that adorn the rocky tundra and explode throughout the spring and summer is a good way to warm your soul. Exploring Churchill’s Arctic summer brings new discoveries as you walk the tundra and explore all the hidden places of the undulating landscape. Enjoy! Round – leaved orchid in Churchill. Natural Habitat Adventures photo. Fireweed in the grass. Rhonda Reed photo. Fireweed on the Precambrian sheild. Steve Selden photo. Polar bear in the fireweed in Churchill. Dennis Fast photo. Fall colors starting to shine through. Ed Bouvier photo. Arctic tern in a nesting area. Rhonda Reid photo. The treeline is the border between two of the world’s great ecosystems: the austere taiga, which is primarily coniferous boreal forest, and the immense and treeless tundra to the north. At the treeline, the taiga and tundra meld and merge in erratic intermingling fashion, as local conditions of soil, moisture, humidity, elevation, precipitation, and permafrost favor or foil the growth of trees. Islands of tundra occur deep within the boreal forest, and oases of trees cluster in sheltered tundra valleys far north of the treeline. Sparse groups of spruce stands weather the wind on the open land and often have branches only on the leeward side. This effect is known as Krumholz. Stand of spruce trees on the open tundra. Steve Selden photo. This line was once the division between human communities. Essentially, the Chipewyan and Cree tribes were a people of the forest, while the Inuit called the tundra and the northern coasts home. Today, the treeline is still a border for many animal species, and this division can often be quite abrupt. The snowshoe hare and its archenemy, the lynx; the red squirrel and its twin foes the marten and fisher; the crossbills, siskins, thrushes, woodpeckers, chickadees, kinglets, and grouse venture to the forest edge, but rarely beyond. To other species, such as ptarmigan, musk ox, arctic fox, and snowy owl, the tundra is home. And a few, like the caribou, commute and spend summer on the tundra and winter within the forest belt. In addition, 10,000 species of insects exist in the boreal forest, while only 500 species live just north of it on the tundra. Unfortunately, the two main insect scourges of the north – black flies and mosquitoes – torment man and beast and fill both the tundra and the taiga with their legions. Photographing the Precambrian shield and sparse treeline. Steve Selden photo. The wind sighs through the treetops, but beneath the blue-green canopy, the air is calm and cool – wind intensity decreases by ninety to ninety-five percent only fifty yards from the forest’s edge. In this deeply shaded realm, few plants can prosper; mosses, lichens, some wintergreens, and horsetails cover the forest floor, and young spruces struggle upward towards the life-giving light. Flocks of chickadees and kinglets flit and flutter high in the trees, busily picking insects and their larvae and eggs. Crossbills use their strangely shaped mandibles to open conifer cones; they pry the scales apart and extract the seeds with their scoop-shaped tongues. Permafrost contains tons of carbon. Ed Bouvier photo. Berries growing on the tundra form a carpet of life. Natural Habitat photo. Boreal botany is very unique, and the diverse flora of Churchill is representative of plant life throughout the barren lands. About 400 different native, vascular plants occur in the region, not including the abundant lichens, fungi, mosses, and algae. Horsetails, club mosses, ferns, conifers, and flowering plants, as well as grasses, sedges, and rushes abound. Lignon berries, crowberries, dewberries, and cloudberries grow right through a natural mulch of living sphagnum moss; minute orchids grow small spikes, which, in turn, sprout flowers no larger than a baby’s fingernail with forms as complex and colorful as any you find in a florist shop; and a miniature rose relative – the white-petaled, yellow-centered arctic dryad – can be seen on sand dunes near the beach and alongside creeping willow shrubs inland, as well as in boreal forest glades. It, along with the bright, reddish-purple legume the locals call ‘sweet vetch,’ is the most commonly found plant in bloom. Churchill wildflowers bloom in stages throughout spring and summer. Grass of Parnassus is one of the more beautiful species. Steve Selden photo. Plants throughout the Arctic survive in a cold, semi-arid climate, with only a three- to four-month growing season. Within these strict parameters, barren land plants have evolved characteristics unique to their environment in order to survive. For example, to adapt to the long, cold winter period, some plants, such as the wintergreen species, begin photosynthesis and grow underneath the snow in late spring. Given the dry climate, three-toothed saxifrage grows within the cracks of rocks, breaking down the rock material for nutrients. 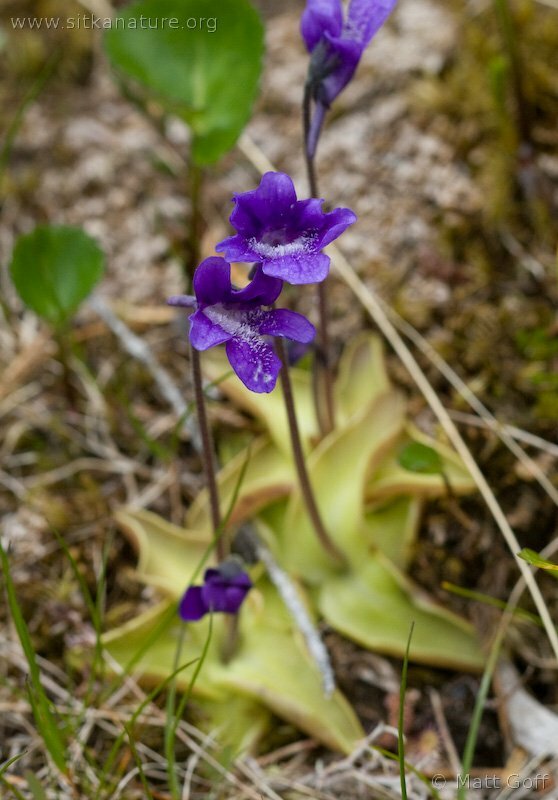 In very moist areas, a carnivorous species called Pinguicula vulgaris, or common butterwort, produces a flower that, at casual glance, looks just like a violet. But it catches, and then digests, tiny insects right on its sticky leaves. Butterwort or Pinguicula Vulgaris is an insect eating plant. Matt Goff photo. This short growing season also forces barren land plants to sprout up, reproduce, and return to dormancy in a relatively short period of time. For this reason, the summer season exposes new crops of plants approximately every few weeks. One week the landscape will be white with the flowers of mountain avens, and soon after, the landscape will be purple with the bloom of Indian paintbrush. These fresh images from Churchillian Katie DeMeulles reveal just a glimpse of Spring in Churchill. The main clue is the ice floe edge is fairly close to shore and the open water lead is widening. Of course that could close up again with some north winds but spring is imminent. It’s such an amazing time of year in Churchill! Willow ptarmigan in the willows. Katie de Meulles photo. The ice floe edge is closer to shore. Katie de Meulles photo. Willow ptarmigan camouflaged in the grass. Katie de Meulles photo. The ice floe edge is close to the rocky shore of Churchill. Katie de Meulles photo. The Ithaca shipwreck still frozen in the Hudson Bay. Katie de Meulles photo. Ptarmigan on the Precambrian shield in Churchill. Katie de Meulles photo. Experiencing Churchill in the winter months potentially can shock one’s physical system. Weathering the weather is really a ‘mind over matter’ concept. However, the beauty of the landscape and the shimmering northern lights soothe the pain of occasional frigid temperatures. Amazing beauty in the Churchill region has a way of heightening one’s pleasure under any circumstances. The addition of Natural Habitat’s Aurora Pod on the Hudson Bay coast now provides another option for experiencing the many facets of natural beauty in Churchill. The frozen bay, precambrian sheild, boreal forest under the aurora borealis in one location enables travelers to experience the Arctic feel in a panoramic setting. Natural Habitat photographer under the northern lights in Churchill. Brad Josephs photo. Natural Habitat staff member Alex under the amazing aurora borealis in Churchill. Brad Josephs photo. Incredible northern lights above the boreal forest in Churchill. Brad Josephs photo. Northern lights with the warm aurora pod in the foreground in Churchill. Brad Josephs photo. Northern lights above the Wapusk Adventures dog yard and teepee in Churchill, Manitoba. Brad Josephs photo. Aurora borealis above road to Churchill. Brad Josephs photo. Come see the spectacular northern lights in Curhchill, Manitoba!